From Mrs. K. Sschuiling to Mr. S.J. Hoogland. 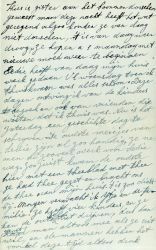 On behalf of Dolten [meant is Dalton] and Geertje I have to thank you for the best wishes they received with your letter. 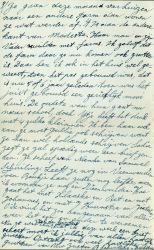 Geertje is able to read and to speak Dutch but she cannot spell well enough to write a letter in Dutch. Dolten [ ] can understand some Dutch words and that is all. When they come over and I cannot say things in English, G[eertje] is the interpreter for us. They made a nice trip, they sent me a postcard every day when I was in hospital, then I also knew where they were. Now I am sitting at my own table in my own home to write. Last Wednesday I came home. They took me outside in a wheel chair. The first days they carried me from the bad into the wheel chair. The last days I had to walk to the wheel chair myself and then the chair was placed at a greater distance every day. It was a hard job for me to learn to walk, but now I am so happy that I can walk through the house with a crutch, from the living to the bedroom and to the bathroom. Although I have two crutches, I trust myself most with one crutch at the left side and Sedie's [Sadie] arm at my right side, then I am not afraid that I will fall. Oh I am still very afraid to fall, but now I become stronger it's getting better. Besides, we all are well. Yesterday Thies [Thijs] was threshing the beans but last night it was a bit rainy, so today they cannot thresh although it is dry again. They hope to start again next Monday. Sedie [ ] was cleaning my house today. Last Wednesday when I came home everything was clean. These days the children came to visit me and also friends who knew that I was home. Today it is Saturday, a nice day to write. Sedie's [ ] oldest girls are so handy, they do such a lot of work for Sedie [ ]. A few minutes ago the oldest came here with a tea-tray and tea. She made tea and brought it to my house, it is so close by. Tomorrow I expect IJtje/Ytje and family. She has four children and she cannot drive a car herself, so her husband always has to come with her when she likes to go out, and the men are always very busy this time of the year. They are going to move to another farm this month, then they will live farther away. It is at the other side of Modesto. Her husband and his father changed farms. I believe the farm where they go to is also bigger. Once I visited that house when it was just new build, which is 5 or 6 years ago now, a comfortable and nice house. Their oldest child is going to school now, but Ytje is very busy with four little one's. 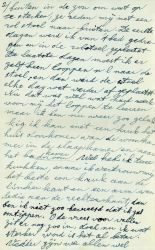 I urge her to write to you because she can write Dutch. Sadie days she will write you soon. 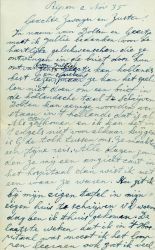 You wrote about Nienke of Samuel Schuiling. Is she still living in Veenwouden? When Boukje, her sister, was alive they lived in Veenwouden I think. How are Klaaske and Bet and Johannes and J. Hoornstra and Jitsche doing? Oh I like it so to hear some about all of them. Well the children wanted me to write a letter this week and I have to greet you all. Also many hearty greetings from your sister B. Schuiling-Dijkstra.